Messaging is a technique to solve communication between disparate systems in a reliable and maintainable manner. You can have various platforms that need to communicate with each other: a Windows service, a Java servlet based web service, an MVC web application etc. Messaging aims to integrate these systems so that they can exchange information in a decoupled fashion. A message bus is probably the most important component in a messaging infrastructure. It is the mechanism that co-ordinates sending and receiving messages in a message queue. There have been numerous ways to solve messaging in the past: Java Messaging Service, MSMQ, IBM MQ, but they never really became widespread. Messaging systems based on those technologies were complex, expensive, difficult to connect to and in general difficult to work with. Also, they didn’t follow any particular messaging standard; each vendor had their own standards that the customers had to adhere to. RabbitMQ is not the only product that implements AMQP: Windows Azure Service Bus, Apache ActiveMQ, StormMQ are some of the other examples. RabbitMQ and the Azure Service Bus are probably enough for most .NET developers. Note that there are different versions of the protocol and some of these products support them to a various degree. RabbitMQ is based on Erlang. There are client libraries for a number of frameworks such as .NET, Java, Ruby etc. We’ll of course be looking at the .NET variant. I’m going to run the installation on Windows 7. By the time you read this post the exact versions of Erlang and RabbitMQ server may be different. Hopefully there won’t be any breaking changes and you’ll be able to complete this tutorial. Again, go through the installation process and accept the defaults. The fact that we received all this text confirms that the RabbitMQ server is up and running and can receive messages. In case the command prompt is complaining that the access was denied then you’ll need to run the command prompt as an administrator: right-click, and Run As Administrator from the context menu. This will open the RabbitMQ management login page. The default username and password is ‘guest’. Click around in the menu a bit. You won’t see much happening yet as there are no queues, no messages, no exchanges etc. Under the Exchanges link you’ll find the 4 exchange types we listed in the introduction. We’re done with the RabbitMQ server setup. 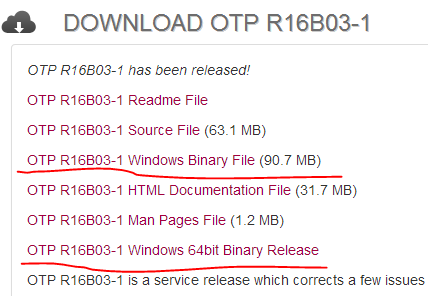 There are two sets of API to interact with RabbitMQ in .NET: the general .NET library and WCF specific bindings. This binding allows the programmer to interact with the RabbitMQ service as if it were a WCF service. From IModel we can access methods to send and receive messages and much more. As we have no channels yet there’s no point in trying to run the available methods on IModel. Let’s return to RabbitMQ and create some queues! We’ll look at creating queues and exchanges in the UI and in code. I’ll skip PowerShell as I’m not a big fan of writing commands in command prompts. Keep the rest unchanged and click Add exchange. The new exchange has been added to the table above. Keep the rest of the options unchanged and press Add queue. The queue has been added to the list of queues on top. Click on its name in the list, scroll down to “Bindings” and click on it. We’ll bind newexchange to newqueue. 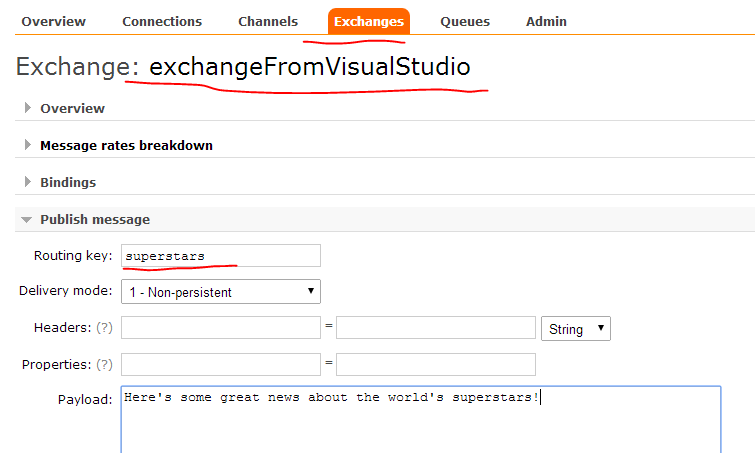 Insert ‘newexchange’ in the “From exchange” text box. We’ll keep it as a straight binding so we’ll not provide any routing key. Press ‘Bind’. The new binding will show up in the list of bindings for this queue. Click on the name of the queue in the table and scroll down to the Get messages section. Open it and press Get Message(s). You should see the message payload you entered in the other browser tab. As you type in the parameters you’ll recognise their names from the form we saw in the management UI. 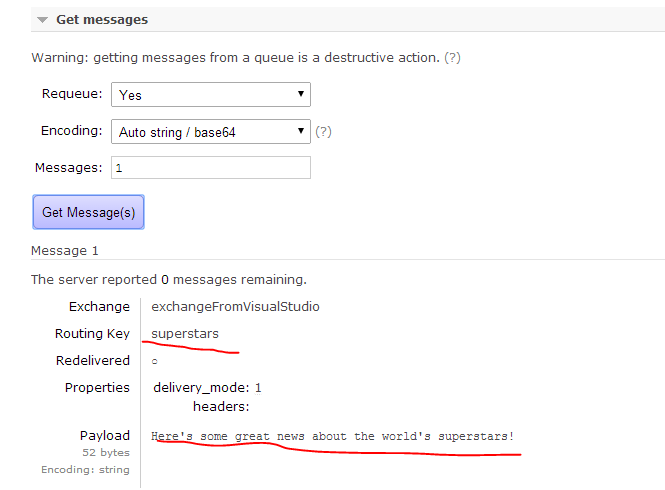 The routing key means that if the message routing key contains the word “superstars” then it will be routed from exchangeFromVisualStudio to queueFromVisualStudio. You can perform the same test with a different routing key, such as “music”. The message should not be delivered. Indeed, the popup message should say that the message has not been routed. This means that there’s no queue listening to messages with that routing key. This concludes our discussion on the basics of messaging with RabbitMQ. We’ll continue with some C# code in the next installment of the series. Very nice and usefull article for me, Andras. Andras, you do a great and helpfull job. Really nice! Thank you! Wonderful Article! Thanks a lot ! Kindly let me know where I can find remaining series . Wonderful job. Very clear, simple and didactic. Thank you very much, your article is very helpful.